When DAZN first announced their plans to enter the US market, their plan was met with skepticism. Their service was built around combat sports, which often featured a loyal fan base but is considered by many to be a niche sport. DAZN was able to secure a deal with Eddie Hearn’s Matchroom Boxing to broadcast 32 events a year, with sixteen fight cards to take place in the United States and sixteen fight cards to take place in the United Kingdom. DAZN also locked up deals with the World Boxing Super Series, Bellator, and Combate Americas to strengthen the quality and quantity of content on their service, but they were still missing a key piece to bolster their appeal to the American viewing public. In order to get that piece they had to rely on their biggest asset. John Skipper served as ESPN’s President for over six years and was instrumental in ESPN’s dominance in the sports market and established several important long term relationships. He resigned from ESPN in late 2017 in response to threats of blackmail and in order to address alleged substance abuse issues related to cocaine. But he re-emerged in May of this year he later re-emerged to serve as the Executive Chairman for the sports media company Perform Group, the group in control of the streaming subscription service DAZN. 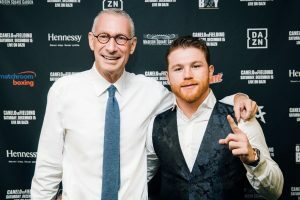 When John Skipper worked for ESPN, one of the smaller deals that he was able to strike was with Golden Boy Promotions to air boxing on their network. It was a smaller deal, but it allowed Skipper to establish a relationship with Golden Boy Promotions and gave him knowledge of the details of Golden Boy’s prior deal with ESPN. This gave Skipper significant insight into the value of Canelo Alvarez. He had to leverage DAZN’s success in international markets, their financial backing, and his own experience in order to finalize a deal with Golden Boy Promotions while being able to insist on an exclusive deal. A short meeting quickly tuned into an intense three day negotiating period that ended with a $365 Million dollar deal to stream Canelo’s next 11 fights as well as the rights to Golden Boy’s other fighters. Canelo had interest from other outlets, including Showtime, Fox, and Turner sports; but it was Skipper who was able to close the deal. DAZN’s deal with Golden Boy Promotions has tilted the balance of power in boxing in their favor. Eddie Hearn immediately saw the great value that DAZN’s deal with Canelo brought. Eddie Hearn also recognizes what signing Canelo means for some of his fighters, like Demetrius Andrade and Billy Joe Saunders, and how DAZN is now the place for the middleweight division. Two of the biggest draws in boxing are arguably Canelo Alvarez and Anthony Joshua. They’re both signed to DAZN. DAZN isn’t done making big splashes in the combat sports world. Subscribe to DAZN NOW and get 30 days free.